If you are using Excel 2007 with Xlsx file format there may be scenarios where you have to encounter damaged or corrupt xlsx file. 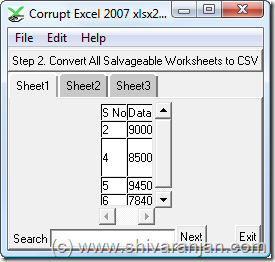 Corrupt-xlsx2csv is free utility that can extract data as xml or CSV file from the damaged or corrupt Xlsx file. To extract the data run Corrupt-xlsx2csv program and point it to the file that has got corrupted. The program will now display the data that it could extract in xml or CSV file format. All you have to do is now save the data in CSV and create a new file out of this data. We have already covered a similar software for recovering data from Docx file format. This program will only extract data from xlsx file format only. The program does not require any installation and can be used as a portable application in USB drives. The utility worked without any issues in Windows XP and Windows Vista.